Over the last few weeks I’ve been putting together a special space for my 7 month old daughter, Willa. 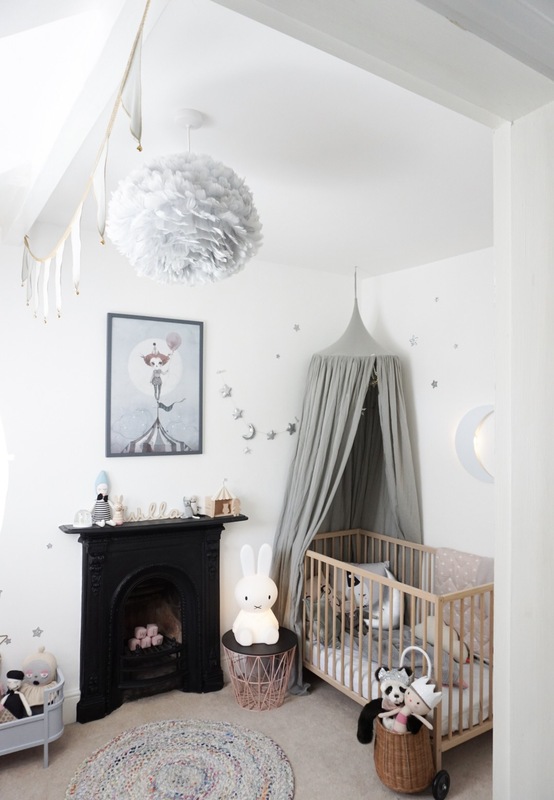 My brief was to create a magical nursery space that would also have many aspects that could grow up with her, rather than a typical ‘nursery’ scheme which would date and become obsolete. My only bugbear is the flooring- an inherited beige carpet that we can’t do much about at the moment! I particularly wanted to introduce greys and soft blush pink to the scheme, and accents of white, silver and black. For now the walls are painted simple white emulsion, but if we stay in our current house for longer then I have plans to paint the walls a muted pale blush pink. 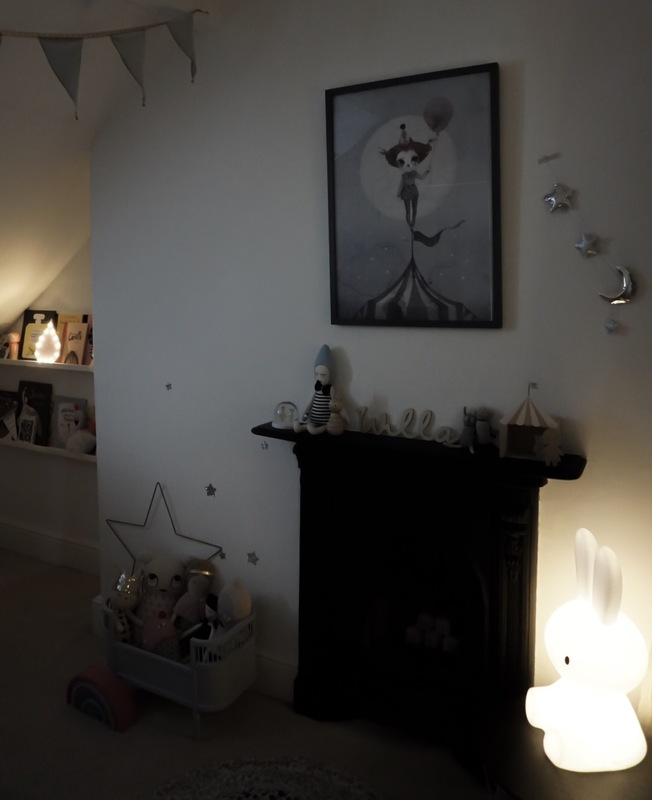 Instead of a wall colour for now, I’ve used Mrs Mighetto circus prints which I sourced from Cissywears and Home and Me which I had framed in painted dark grey wood and stick on silver glitter stars from Little Cloud Kids. 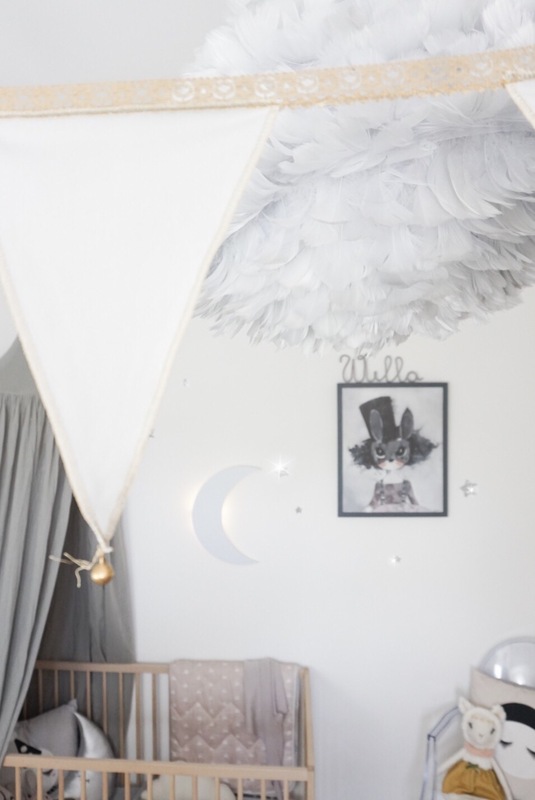 Willa’s Room has sloping ceilings and beams which are painted white, so I strung up Numero74 grey velvet bunting from Scandiminis and I treat Willa (myself) to a grey feather Vita Eos light shade because I knew it would be perfect. Fortunately the ceilings are still fairly high so that we were able to hang up her grey Numero 74 canopy (also from Scandiminis) on a cup hook inserted into a plug in the ceiling and I strung battery lights from lights4fun inside which are on fine metal thread. 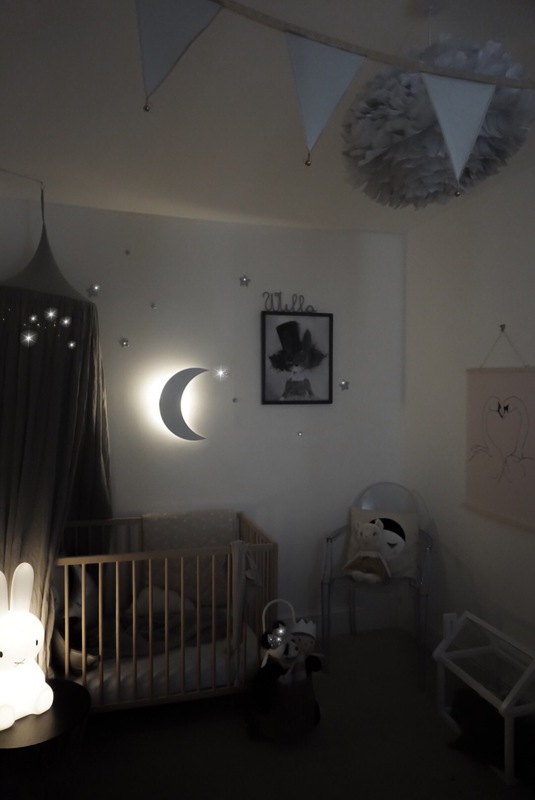 I wanted to find something for the back wall behind Willa’s cot to team up with her sparkly star wall stickers, and I found the perfect white crescent moon light from Lights4fun. It’s ideal as it’s so simple, and can be switched on and off on the side and easily mounted on the wall. I love the simplicity of it- it was just what I wanted for that area of the wall and it’s so dreamy at night. 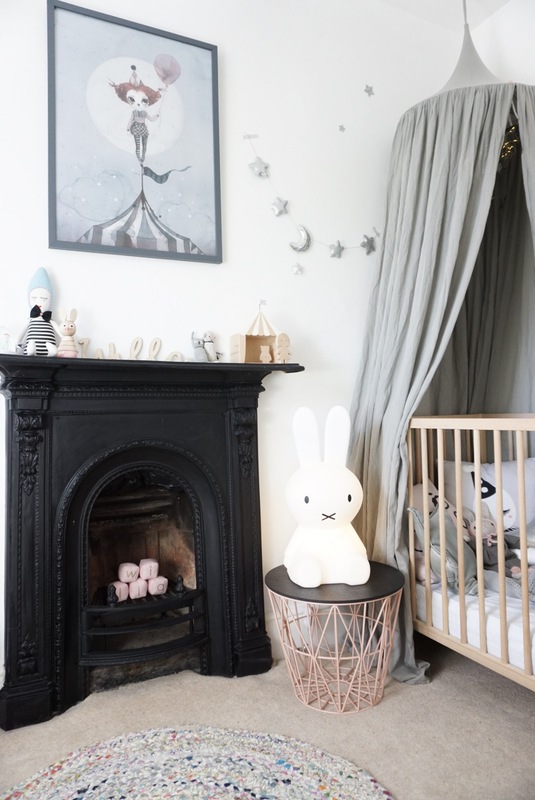 Next to Willa’s cot stands a beautiful solid wire basket with lid, sourced from The Modern Nursery, and I’ve used it as a stand for Willa’s Miffy light which has a dimmer switch so creates a lovely soft light in her nursery by night. Other lovely lighting comes from Ginger Rock Designs and is a sparkly blush raindrop that sits on her bookshelves alongside magical bird toys from Ilka Design. We are really lucky to have an original Victorian fireplace in Willa’s room and it makes for a beautiful focal point. It’s the ideal place to store some of her treasures which I’ve carefully displayed. 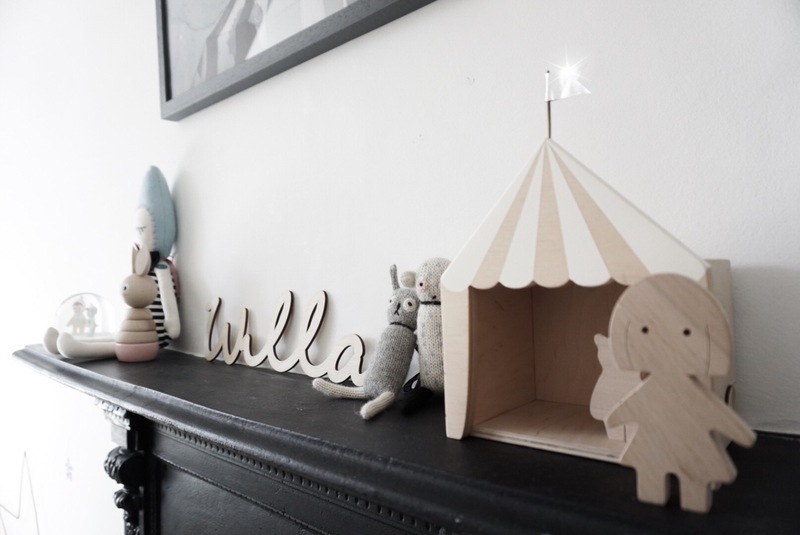 Her plywood name is by Lala Loves Decor and her wooden circus tent by UP! 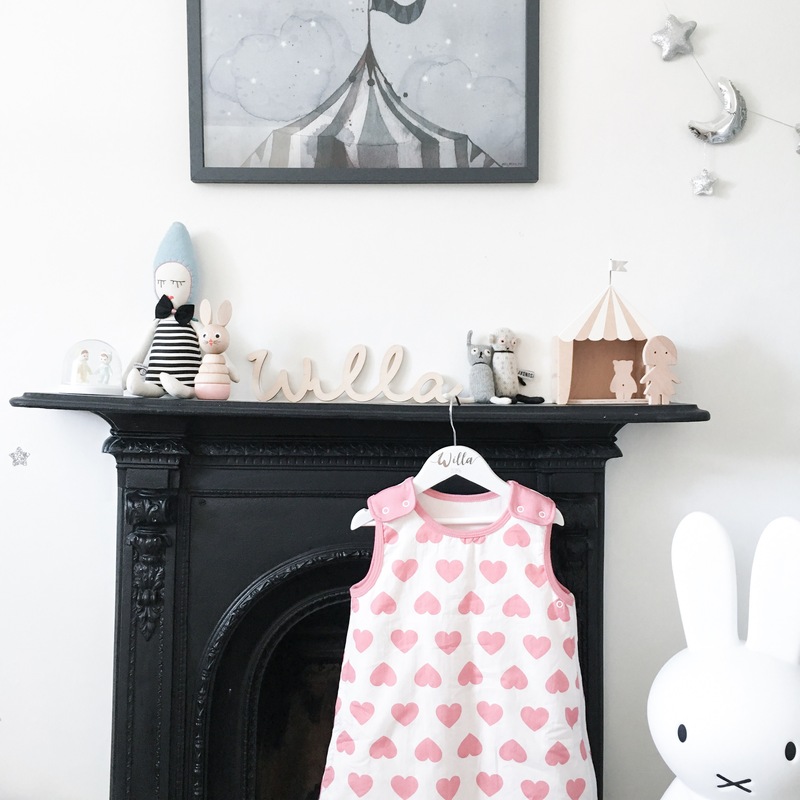 Warsaw from Emi and Nell (UK stockist) which is a nice match with her Miss Mighetto circus collection framed posters. 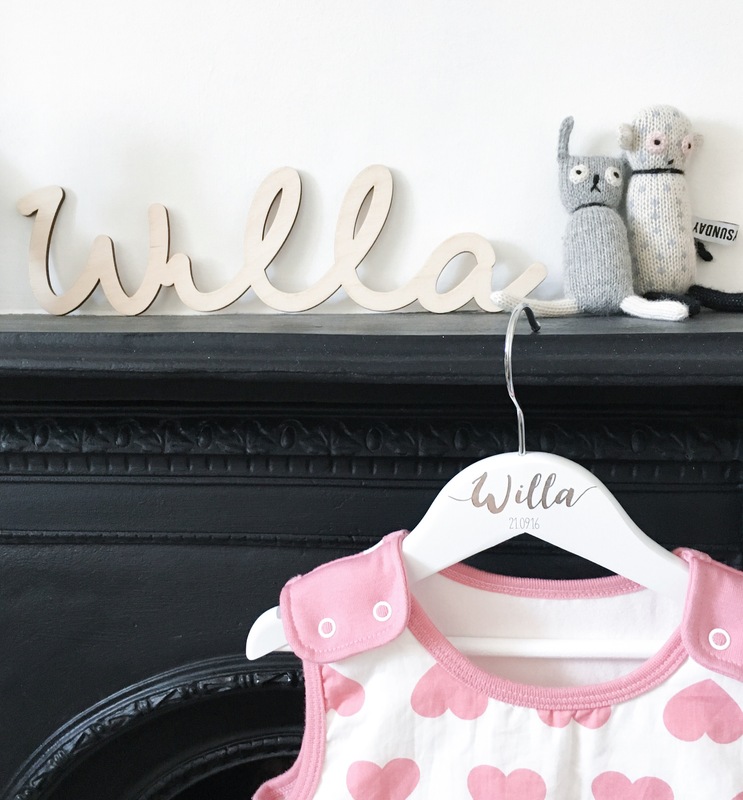 Gorgeous Babasac from Mamadesigns in pink hearts- hung on her personalised hanger by Sophia Victoria Joy. Willa’s simple cot is just from Ikea, as I’d rather buy her a beautiful bed when she’s old enough, rather than spending a fortune on matchy matchy nursery furniture. Willa’s rag rug pulls together all the pastel shades and is by Bloomingville interiors. I found it via the Scandinavian Design Centre. The toy cot next to the fireplace is from This Modern Life which is full of Willa’s toy friends. In the fireplace are Willa’s gorgeous pink letter blocks by Too Many PJ’s (you can order any letter combinations to spell out any phrase or name). 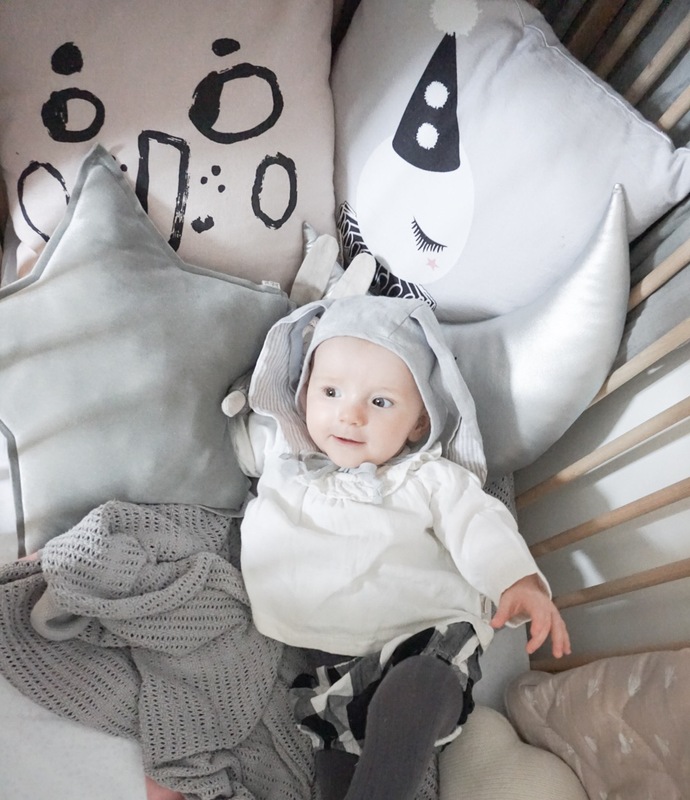 Swan print by Pax and Hart from The Little Baby Company, Louis Ghost chair by Kartell, and luggy toy basket from Olli Ella at This Modern Life. Willa’s crochet name is from Little Cloud Kids and her quilted swan coverlet is by Cam Cam Copenhagen. It’s the perfect dusty pink shade. 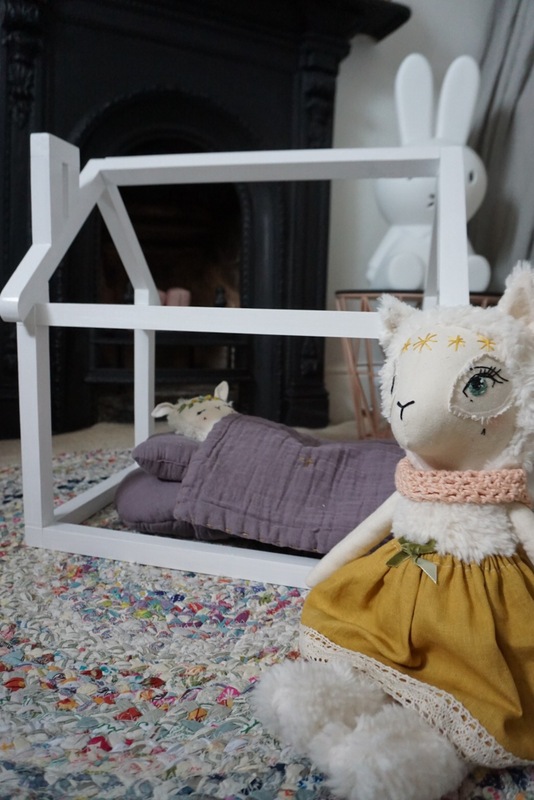 Willa has the most beautiful lamb toys from Just Acorn which are immaculately handmade. They are divine and Barbara from Just Acorn makes just a few different creatures each week to sell. 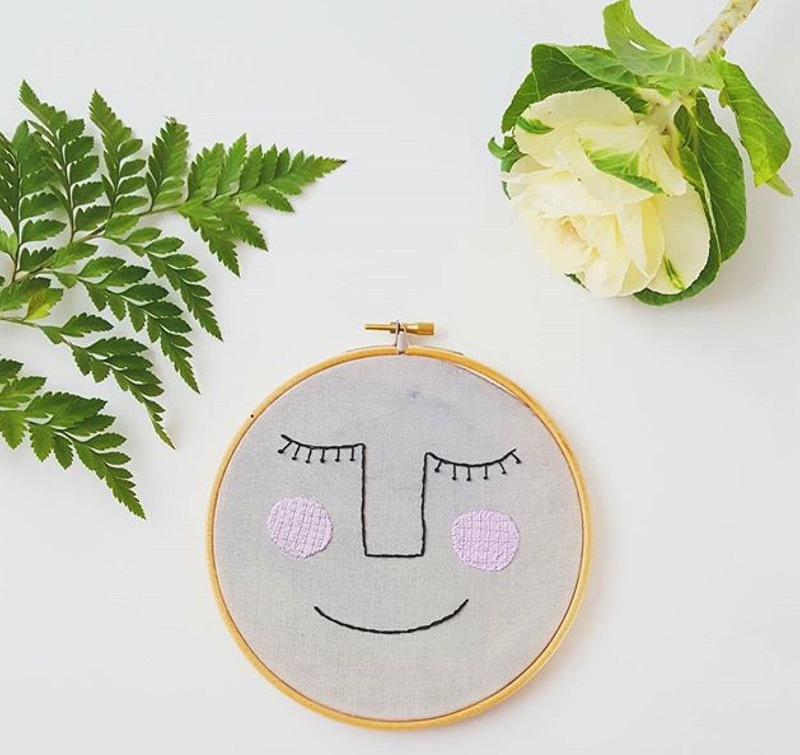 It’s worth following her on Instagram at instagram.com/just_acorn for updates on her magical creations. I don’t think it’ll be long until I’m buying a friend for Mrs Lamb and her sleepy baby! Beautiful house dolls cot by Jones and Parker toys. Of course, Willa had to have her own Velveteen Babies garland, so I created this style with her room in mind. Silvery stars and a shiny moon are perfect next to her canopy and aren’t overbearing when there’s so much going on in her scheme. I also bought a beautiful silver moon cushion from Marjorie Minnie and a grey velvet Numero 74 star cushion to sit in her cot to coordinate the scheme. Further cushions from The Velvet Egg tie in with the circus references. The final flourish will be the addition of this Aro for kids embroidery, which I’ve ordered. I can’t wait for it to arrive!